1) On Wednesday, for the first time in 50 years, a U.S. passenger airline completed a commercial flight to Cuba. The landing may go down as one of the enduring symbols of thawing diplomatic relations between Washington and Havana. “The JetBlue Airways Flight 387—with Transportation Secretary Anthony Foxx on board—landed Wednesday in Santa Clara, Cuba,” reports Fortune. 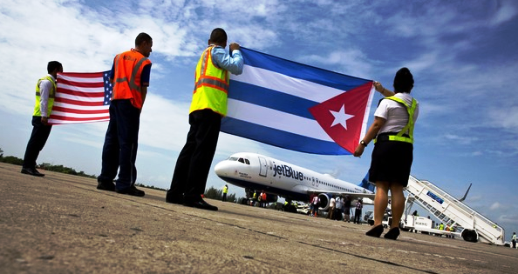 “Earlier this summer, the Transportation Department approved six U.S. passenger airlines including JetBlue and one all-cargo airline to serve cities in Cuba other than Havana. On Wednesday, the federal agency gave final approval for eight airlines to fly to Havana, including Alaska Airlines, American Airlines, Delta Air Lines, Frontier Airlines, JetBlue Airways, Southwest Airlines, Spirit Airlines, and United Airlines. The newly approved flights will provide service to Havana from Atlanta, Charlotte, Fort Lauderdale, Houston, Los Angeles, Miami, Newark, New York City, Orlando, and Tampa, Foxx said in a blog post about the historic flight.” In order to make the trip to Cuba, however, Americans must still cite a reason other than tourism, such as family visits, journalistic activity, religion, or educational activities. And, yes, there are cigar-centric tours that seem to qualify under the educational category. 3) Even though the FDA regulations on cigars went into effect weeks ago, the FDA is only beginning to issue guidance on how the industry will need to comply. One such guidance was issued this week on warning label requirements for cigars, although the agency is asking for public comments on the rules. 4) Inside the Industry: Nomad Cigar Company announced the expansion of the SA-17 Lancero to additional retailers. The cigar (7 x 38) was blended and rolled in Estelí at Tabacalera A.J. Fernandez, and it features a San Andrés wrapper and Nicaraguan binder and filler. It comes in 21-count boxes and sells for $9.75. 5) From the Archives: Even the best cigar can be ruined by a bad cut. So read our tip on getting a proper cut. In it, we walk you though how to pick the proper cut for each cigar. 6) Deal of the Week: StogieGuys.com recommends Bespoke Post, a monthly collection of awesome items delivered to your door for just $45. Past boxes include fine bar accessories, shaving kits, coffee, exclusive E.P. Carrillo cigars, and more. You can skip or purchase every month. Currently available are boxes with themes including beer tasting, pretzel making, Asian cooking, and pizza making. Click here to sign up today.